It’s darling daughter no 3’s 16th birthday today. How can I have 3 daughters over the age of 16? it is a cliché I know, but time goes so fast! We had lunch with her grandparents yesterday to celebrate and today she is going to dinner and the cinema with her dad and my eldest daughter. 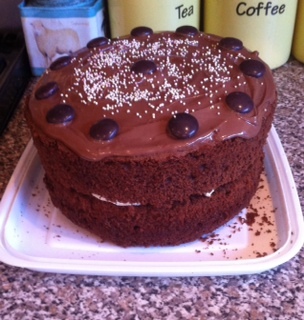 We will have lunch here together first though and a slice of the Hairy Bikers chocolate birthday cake I have made. It is an absolute monster cake! I think it will last quite a few days. It looks delicious and, apart from the cream, it was made completely from ingredients I had in the store cupboard. I doubled the ingredients below to make this size cake. Preheat the oven to 170C/325F/Gas 3 and grease/line a 25cm/10in cake tin. In a large bowl, cream the butter and sugar together until the mixture is pale and light. In a separate bowl, stir the sunflower oil and vanilla extract into the beaten eggs. Gradually beat the egg mixture into the butter and sugar mixture until the mixture is well combined. Add the flour, bicarbonate of soda, baking powder, salt, cinnamon and cocoa powder and gradually fold in. Add the cola and stir. Pour into the tin and bake for 1hr 15 mins to 1hr 20 mins, until the cake has risen and a skewer comes out clean. Remove the cake from the tin and cool on a rack. When cool, carefully cut in half to create two thin cakes. Spread over the jam, then the cream and sandwich the cakes together. Next you need to melt your chocolate. I prefer to do this over a pan of simmering water, but you can do it in the microwave. Spread it over your cake, then decorate with the sweets. I love the Hairy Bikers. Their recipes seem so reliable.